In February 2017, Melbourne Water were nominated as the lead agency in the development of the Yarra Strategic Plan to enable the Yarra River to be managed and cared for as one living and integrated entity. A key requirement of the plan was the inclusion of a 50-year community vision for the river. Beginning in September 2017, Melbourne Water gathered information about what the community values and how they want the river to be cared for in the future. In February 2018, Melbourne Water brought together Wurundjeri Elders with 24 passionate citizens to write a 50-year community vision for the Yarra. The group used the stories gathered from the broader community to write a vision for each of the Yarra’s four reaches (upper rural, lower rural, suburban and inner-city) and an overarching vision for the whole river. These visions will provide the building blocks for how the river and its land are used and managed in future, to ensure the Yarra remains a proud part of Victoria’s identity. Melbourne Water now need your help to write a Yarra Strategic Plan that brings the vision to life. Have your say at workshops in Healesville (Upper Rural), Warrandyte (Suburban and Upper Rural) and Alphington (Inner-city and Suburban) on Saturday 16 and Sunday 17 June. Tea, coffee and a light snack will be provided. For more details and to register, please visit the Workshop Eventbrite page. Feedback and thoughts can also be submitted via the Imagine the Yarra interactive map. 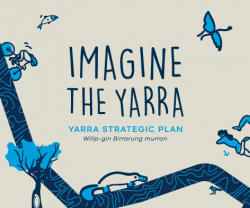 Visit the Imagine the Yarra website for more information about the Yarra Strategic Plan.